The First World War is remembered as a new type of war, in which such technological developments as the tank and the aircraft were used for the first time, but also completely dependent on conventional weapons such as, for example, the rifle or the gun. There were no radical changes in the technology of these types of weapons during the four years of the Great War, but they were constantly improved and had already moved far away from comparable types of weapons used in the 19th Century and earlier. In 1915, the British corporation Vickers created a new 8-inch caliber gun, which received the military index Mk.VI. This was a significant constructive modernization of the previous development of Mk.V, the improvements touched first of all the hydraulic mechanism of the rollback of the gun barrel. In combat, the shelling sector was 4 degrees to the left or to the right, or to 50 degrees up. The state-owned part of the gun has acquired a new, more modern look. 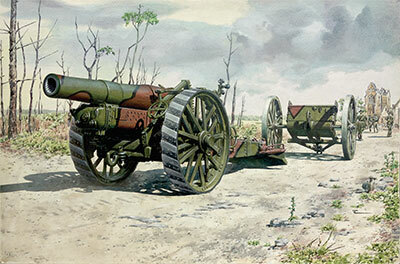 The combat range of the shot reached almost 10 kilometers, but the weight of the gun compared with the previous version increased by more than three tons. In order to transport the gun to combat positions, it clashed with a cumbersome fore part. Which clings to the heavy haulers of that time, such as the FWD truck or the Holt 75 tractor Besides the Vickers plants, artillery production was also initiated at the facilities of the Armstrong company, and licensed by the US plants of the Midvale Steel and Ordnance Co., at Nicetown, Pennsylvania. This type of gun was not only widely used on the First World War battlefields of the Western Front, but also in Macedonia and in Palestine. In addition to service in the British Army, it was employed by the artillery divisions of the Dominions of the Empire - Australia and Canada. Furthermore, within the framework of the co-operation agreements of the Entente, a small number of Mark VIs found their way to Imperial Russia. Most surprising was the story of the Mark VIs built in the USA. After the end of the First World War, they, like most of the rest of the armament of the American Army, returned home, where they were mothballed. However, in 1939, after the Soviet aggression against Finland and the Finnish appeal to the Western powers to provide military assistance, 32 Mark VI howitzers, along with other types of weapons, were sent to the country. They remained in service even after the end of the Second World War, and only in the late 1960s were withdrawn from the ranks of the army as obsolete, and individual examples were given to museums, which they are exhibited today.